How can we protect our whales and other marine life from plastic pollution? Plastic pollution involves the accumulation of plastic products in the environment that adversely affects wildlife, wildlife habitat, or humans. It acts as pollutant not just to humans but to the marine life as well. In the ocean, plastic debris injures and kills fish, seabirds and marine mammals. Marine plastic pollution has impacted at least 267 species worldwide, including 86% of all sea turtle species, 44% of all seabird species and 43% of all marinemammal species. 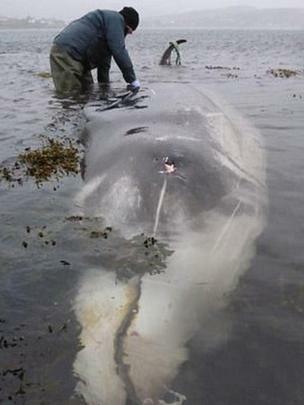 Scientists recovered four kilos of plastic bags from the stomach of a whale found stranded on Skye. The Cuvier’s beaked whale was put to sleep on welfare grounds after it got into difficulty near Broadford in December 2015. The bags were found during a necropsy done the following day by the Scottish Marine Animal Stranding Scheme (SMASS). A Sky Atlantic documentary later on Wednesday will show scientists uncovering large quantities of plastic. Inverness-based SMASS undertakes post-mortem examinations on marine animals, such as whales, dolphins and basking sharks, to discover why they died. The 6m-long adult male Cuvier’s beaked whale appeared to be in good condition externally. However, when SMASS made their examination they found the bags and other plastic debris in every part of its stomach. Internal damage to the whale included irritated and inflamed stomach and intestinal walls. A spokesman for SMASS said: “These findings suggest the plastic impaction was very significant and likely very sore, causing the animal to drift into shallower waters and live strand. Cuvier’s beaked whales are able to dive up to 3,000m deep for more than two hours, and are seldom found in shallow waters close to mainland shores. SMASS was also involved in work that revealed last month that one of the UK’s last killer whales was contaminated with “shocking” levels of a toxic chemical. The animal, called Lulu, was found dead on the Isle of Tiree in the Inner Hebrides last year after becoming entangled in fishing lines. Tests revealed her body contained among the highest levels of polychlorinated biphenyls, or PCBs, ever recorded.